Any true aviation or military history enthusiast will already be familiar with Brigadier General (Ret.) Robert Lee Scott. Who hasn’t read or at least heard of “God is My Copilot”? But unlike most chapter namesakes, he had a personal relationship with ‘his” chapter, IPMS/General Robert L Scott. Our relationship went far beyond just the use of his name: he was a true friend. But how can you describe a many who has done so very much? Certainly, his WWII exploits in China are well known, as he started off flying alongside General Chennault’s famous Flying Tigers, and then became their commander when the world’s most famous volunteer flying unit was brought into the AAF as the 23rd Pursuit Group. But those are just the best known of his many exploits. But his retirement in Arizona had quickly chafed; especially so when in 1972 he had to fight through the agonizing loss to cancer of ”Kitty Rix”, his beloved wife of 34 years. Sunny Arizona now seemed an elephant graveyard. He was much too vibrant and full of life for gloomy “old folks” thoughts. One of his boyhood goals had been to experience the Great Wall of China, a fascination stemming from as a child reading a 1920’s National Geographic article about the wall while waiting in a Macon doctor’s waiting room. 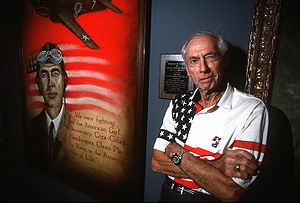 He had actually first seen the wall during WWII, from the cockpit of his P-51 during his second combat tour in China: the wall was then still in Japanese-controlled territory. Typically, that brief glimpse had made him vow all the more to see the wall up “close and personal”. But after WWII, China soon became a hostile communist country; personal travel to the wall was impossible for many more years. But after much effort and many letters, he was actually able to achieve his goal of WALKING the wall’s formidable length, alone, from the Gobi desert to the sea; by this time he was in his seventies. On return to Arizona, his lifestyle of the typical retiree became even less inviting. He was about to move to California to be near his daughter and her family. Back in Georgia, the local IPMS model club had carried his name (with his enthusiastic permission, obtained by mail) from its very beginnings in 1976. By the mid-1980’s, the chapter was meeting in the fledgling Robins AFB Museum of Aviation, even securing a permanent display case to exhibit models of his airplanes and related memorabilia. Someone thought that it would be a super idea if we could somehow get to actually meet General Scott, and perhaps add a personal touch to the display. Chapter officer Bruce Radebaugh knew that General Scott was periodically invited to speak to senior USAF officer-students at the USAF’s Air University “Gathering of Eagles” leadership seminars at Maxwell AFB in Alabama. The next logical thought presented itself: if the general would be this close, why not ask him to address his namesake IPMS chapter at a dinner meeting, and possibly secure mementos of his long career for our museum display case? Sure enough, General Scott DID like our idea, and came to address our club. He most thoroughly impressed everyone from the first moment when, in his late seventies arriving at the museum he bounded out of his car and virtually ran to greet us. His vitality and enthusiasm were amazing. Before it was time to leave, he had been invited to return to middle Georgia as permanent spokesman for the museum ..his return to Arizona was only to pack up for a permanent return to Georgia. At the time, the museum was housed in relocated temporary buildings brought to Robins after earlier being condemned at another base: all aircraft were displayed outdoors. Although he would be the last to claim any credit, his arrival coincided with period of tremendous growth of the museum. (In twenty years, the museum went from zero to the 2nd largest USAF museum, and overall the 4th largest aviation museum in the country.) For once, at least, Wolfe has been proven very, VERY wrong! General Scott with RLS chapter members Bill Paul, Jerry Hall, and Fred Horky, shortly after he moved to Georgia. Posed in front of the RAFB Museum’s General Scott display …note IPMS/USA Chapter of the Year trophy at right. A tireless promoter, he spoke at events all over the state ….and often at those events, he frequently credited our club for having inspired his return. At every event, he always had time for every visitor …especially the kids. And always, the underlying message was preparedness. This born fighter pilot will always be identified with the P-40, of course, but his log book contains everything from P-6 through the “century series” fighters, and many more, along the way amassing more than 30,000 flight hours. General Scott in front of the RAFB Air Museum’s P-40. 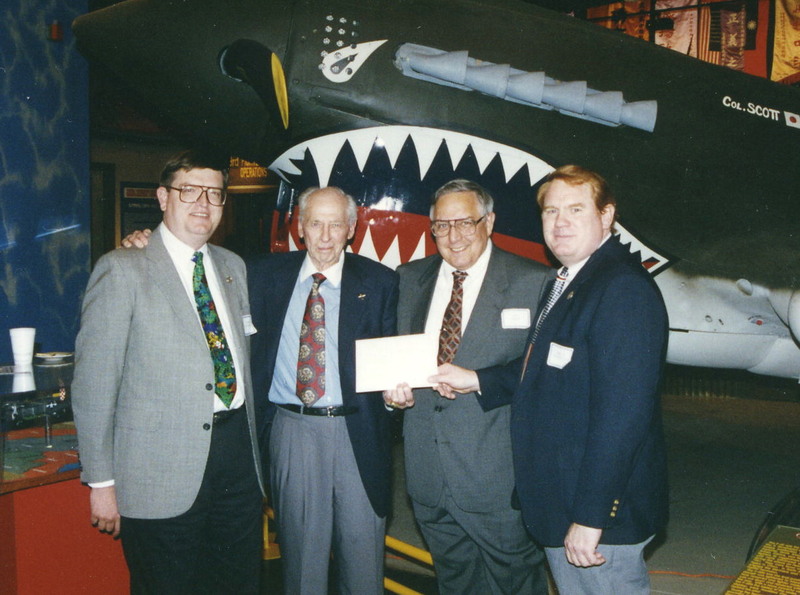 with his namesake IPMS/USA chapter officers David von Almen, Fred Horky, and Bruce Radebaugh. He found time to write a string of very successful books; most had an underlying theme of military aviation and American preparedness. Some have snickered at the title of General Scott’s first, and most famous, book; “God is My Copilot”, as if anyone who put God in the right seat just HAD to be more than a little self-centered. They couldn’t be farther from the truth: he meant that phrase in every POSITIVE way. You just had to have met and talked with the man to understand, and we in “his” chapter were fortunate to have that opportunity for twenty years. The other events …the tales of flying the F-16 (solo! ), F-15, well into his seventies and eighties; and the B-1 on his 89th birthday. There is more …like running the Olympic torch for the 1996 Atlanta games ….but all that can be seen in other obituaries or read in his numerous books. General Scott passed away on February 27th, 2006, two months short of his 98th birthday. The nation had lost a great patriot and hero, a patriot and hero in every sense of those words. The Robins AFB Museum of Aviation had lost its public voice and most enthusiastic cheerleader: he is sorely missed there as well. All of us in his namesake IPMS chapter had lost a true friend. Each of us have a vacant spot inside that will likely not be filled for a very long time.